The lyric ‘ain’t no mountain high enough, ain’t no river wide enough’ could easily be the motto of Trails to Empower Kids (TREK), a mountaineering group that brings aid to children in isolated areas. Now on its fifth year, the group is selling limited edition HeadWare to raise funds for its programs. 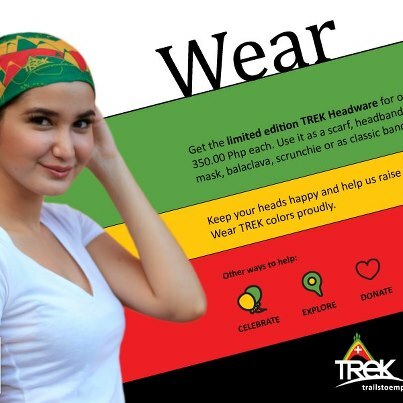 The rasta-inspired HeadWare was designed by TREK volunteer and artist Third Marquez. HeadWare is an elastic, tubular, stretchable, and breathable headgear. It can be worn twenty ways. Some have worn it as a scrunchie, balaclava, a skirt, a beanie, a tube top, or a scarf. Made of 100% Polyester Microfibre, HeadWare was designed for those who love the outdoors. “We hope we can reach more children, help more communities through this fund raising project,” states Kelly Austria, one of the group’s founders. The group marks anniversary by bringing books and school supplies to communities in Kibungan, Benguet from November 30 to December 9. TREK has previously conducted missions for the Ibaloi children of Itogon, Benguet; Sentrong Paaralan ng mga Agta of Casiguran, Aurora; Lubo Elementary School and High School in Kalinga and several schools in Apayao.